Why Play In A Recital? All recitals are held in the store unless noted. Doors open a half hour before performance for warmups and seating. No tickets are required, but due to limited space we ask you to keep guests to a maximum of 4 per student. Sorry, loge seating is not available. performance offers an additional layer of benefits. When you share your music with others, your unique voice is heard, and you demonstrate to all who have not come as far as you on the path what is possible with practice. 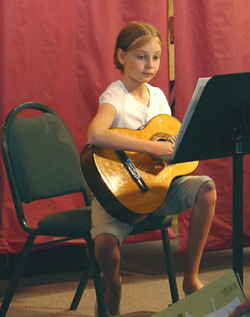 We offer recital opportunities almost every month except December. (Since our "recital hall" is the store, the salesfloor is just too crammed with merchandise from Thanksgiving until the end of the year to move everything out and set up chairs!) The calendar at right shows the upcoming dates. These recitals are usually on Sundays (when the store is closed) at 2:00 pm, and if needed, also at 4:00 or 4:30 pm. We program few enough students per recital that they seldom last over an hour. Don't worry about killing the day or evening with a marathon "cattle call"! 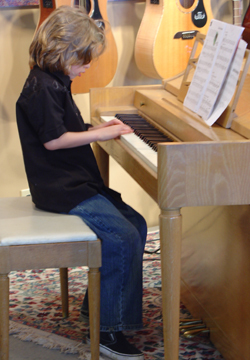 Any mix of instruments may appear on a recital--most recitals feature students from several teachers. We're not only emphasizing soloists, either. 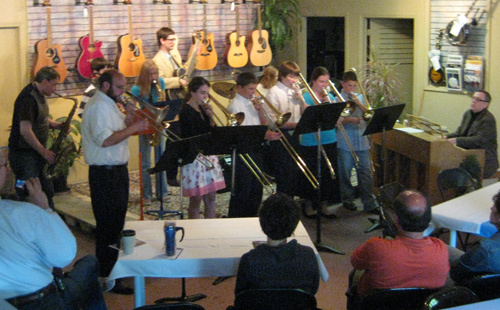 You may perform with a friend, your teacher, or sometimes in larger ensembles. The emphasis is on presenting a good performance without limiting it to a particular style or instrument. We also want this to be as stress free as possible. 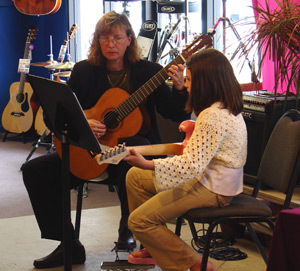 Shy students sometimes feel much more confident if their first recital performance is with their teacher, for example. 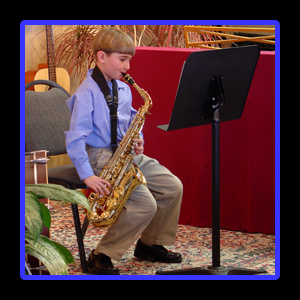 We also are offering "theme" recitals devoted to jazz, chamber music, student compositions, and pop styles as interest arises. We fully appreciate the intimidation adults feel when following the cutest-five-year-old-violinist-in-the-world with their beginner piece. 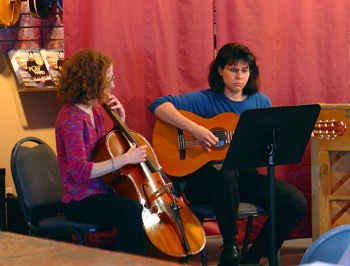 For those who want, so to speak, a "level playing field", we offer periodic recitals exclusively for our adult students. We encourage the adults to come even if they're not performing, both as a show of solidarity (any adult doing this understands what it takes to go on stage!)  and to use the opportunity to meet and network with other people interested in making music. Recreational Music Making is growing--but many adults still feel isolated in their musical pursuits. Attending an adult recital proves you're in good company! If you'd like to participate in any of our recitals, ask your teacher--or talk to us at the store and we can help you make all the arrangements! students an opportunity to create a collaborative jazz performance and present it for an audience in a "club" format. Students work on selected songs with their teacher, build improvisation skills, and learn an ensemble part for the pereformance. Then, on the day of the Jazz Cafe, we bring all of them together for an afternoon rehearsal/workshop with their teachers (and often guest mentors. ) That evening, they present the results for family and friends at the "Jazz Cafe", an informal performance/ jam session capped by a faculty set. The combination of careful preparation and on-the-fly improvisation is great real-world training, as is the opportunity to work side-by-side with professional players.